PCOS and infertility is a devastating combination. Since PCOS (Polycystic Ovarian Syndrome) affects 8-10% of women of reproductive age, it is fair to say a good proportion of patients being treated at specialist clinics have this condition. The good news is with proper care and the right advice, your chances of getting pregnant become more of a reality. All of my friends are getting pregnant, why not me? Sometimes our world seems so unfair. Why is that there are so many unwanted children born into the world, whereas, so many couples struggle to conceive? If you have been trying to concieve without contraception for 12 months or more, it is wise for you to seek an opinion and diagnosis from your doctor and/or reproductive endocrinologist. If you have been diagnosed with PCOS, then by addressing the underlying causes of PCOS with a suitable PCOS diet and hormone balancing support, it is possible to increase your chances of getting pregnant. 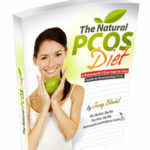 The Natural PCOS Diet provides all you need to know to manage and overcome PCOS naturally. Want to know which is the best fertility diet to follow for PCOS? Is it Paleo, low GI, low GL (glycemic load), organic, gluten-free, dairy-free? It is a mindfield isn’t it. Take the guess work out and follow The Natural PCOS Diet plan to help you overcome PCOS and concieve naturally! Realise the best stress support solutions to help you cope better! The Natural PCOS Diet contains detailed information on the RIGHT type of diet to follow, supplements, specific herbs and other naturopathic tips to overcome your PCOS naturally. Plus, as a bonus, you will receive The Natural PCOS Cookbook, complete with PCOS diet recipes. Takes the guesswork away! Can I follow this diet if I am doing IVF? Sometimes with the best of intentions on your part, fertility treatment such as IVF may be necessary for you to have a baby. Don’t beat yourself up about this. 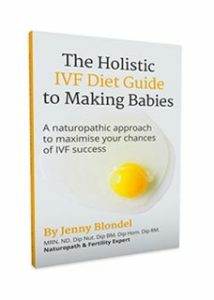 The good news is that I recently launched my second book, The Holistic IVF Diet Guide to Making Babies which emphasises the importance of preconceptual care as well as providing essential information to help correct underlying nutritional deficiencies, optimise egg quality and sperm health to boost your chances of success greatly! Remember, it is not just YOU taking charge of your hormones, it is the health of your husband/partner/boyfriend/sperm donar that is just as important. Make sure he has a sperm analysis performed and nutrient levels assessed. Diet, supplements and lifestyle changes can greatly affect egg fertilisation, implantation and the health of the developing baby. More good news is I haven’t left the men out, a detailed men’s supplement and diet guide is also found in my book, The Holistic IVF Diet Guide to Making Babies!